With just two million inhabitants, the small Republic of Macedonia receives very little coverage and news reporting. Last week, however, images of the attack on numerous Macedonian MPs, including opposition leader Zoran Zaev, hit global headlines. The unprecedented violent storming of the Macedonian Parliament was carried out by supporters of the right-wing party VMRO-DPMNE, who had been in command of Macedonia throughout the last decade. Although it was the most voted party in the December 11 elections, the small advantage enjoyed by former Prime Minister Nikola Gruevski did not guarantee the parliamentary majority required to form a government. A coalition between the second party, the Social Democratic Union (SDSM) and the third, the Albanian Democratic Union for Integration (DUI), was then envisaged. 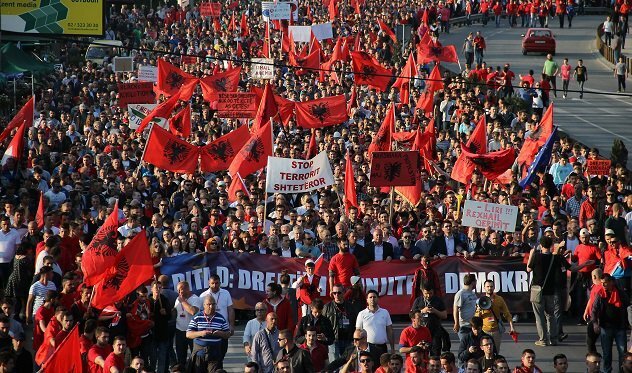 However, the agreement, which included the election of an ethnic Albanian speaker, Talat Xhaferi, sparked protests among nationalists, who claimed the pact between the two parties poses a threat to the unity of the country. The president, Gjoerge Ivanov (also from VMRO), prevented the Social Democrats to have coalition talks, warning of the danger of „Albanianising“ in Macedonia. Furthermore, the idea of relinquishing power does not entertain former PM Gruevski. Under the notion that the SDSM works against the interests of Macedonians, whilst serving the Albanian minority (about a quarter of the country’s population), the VMRO leader has refused to accept any compromise. Nevertheless, the outgoing PM, Nikola Gruevski has left his mark on the country: he was the creator of Skopje 2014, an ambitious project that adorned the capital with monumental statues of characters such as Alexander the Great, turning Skopje into a historic theme park. Public investment of more than 500 million euros caused public outrage in a country with high levels of poverty. After four months of political deadlock, the deep crisis raises the fear of unpredictable consequences. With politicians seemingly at loggerheads, Macedonians hope for a speedy breakthrough in order to avoid escalating tensions and even the outbreak of interethnic conflict.